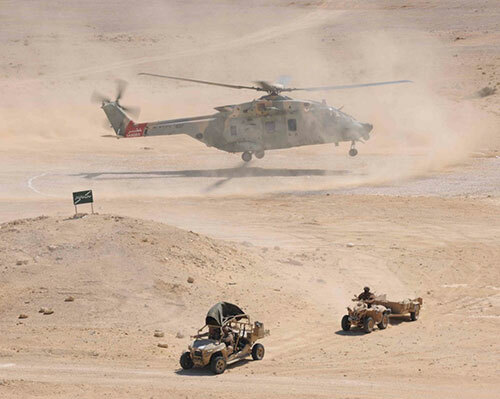 The Royal Army of Oman (RAO), represented by the South Oman Battalion at the 11th Infantry Brigade, with the US 22nd Marine Expeditionary Unit, carried out demonstration of the joint Omani-US Naval Exercise (Jundi Al Bahr or Marine) with the support of the Royal Air Force of Oman (RAFO). The demonstration of the joint exercise was held at the RAO Rabkot fields. The participating forces carried out the plans outlined to achieve the training objectives of the exercise during which the participants showed a high level of performance and morale, according to Oman News Agency (ONA). The events of the exercise reflected competence and abilities enjoyed by the RAO personnel that indicate the levels of training, qualification and the ability to harmonize in the implementation of joint tasks. The implementation of such exercises comes within the framework of RAO training plan to maintain the high level of performance, training and combat efficiency among the RAO personnel, and within the annual training programs that are implemented with the sisterly and friendly countries. The demonstration of the joint exercise was held under the patronage of Major General Mattar bin Salim al-Balushi, RAO Commander in the presence of Brigadier General Matthew Trollinger, Commander of Task Force 51/5, Senior Officers and Officers of the Sultan’s Armed Forces (SAF), other military and security departments and US commissioned and non-commissioned Officers.